Available on GSA Contract Number GS-02F-0093V LOWEST GSA PRICE AVAILABLE DELIVERED! The PD-4 Mobile Hard Drive Physical Destroyer automatically destroys all formats and sizes of hard drives in order to ensure the information contained on the hard drive is no longer accessible. It bends, breaks and mangles the hard drive and completely breaks, bends, mangles, and destroys the data platter(s) upon which data is stored. The machine destroys multible hard drives with each pass, and this complete physical destruction easily identifies EVERY drive which has been destroyed and designated for disposal. The PD-4 Mobile Hard Drive Physical Destroyer meets compliance standards for mandates requiring destruction of hard drives containing private and confidential information before hard drive disposal. 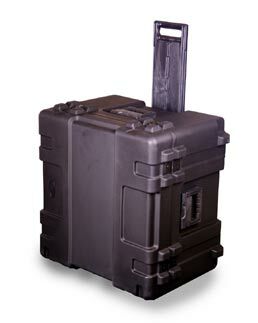 This unit is easily transportable, as a transportation and carrying case is optionally available ( a $595 option). You can now take your destroyer easily to the hard drives to be discarded, and this feature is particularly attractive to off-site disposition projects. At a comparatively light 82 pounds, this is the lightest destroyer available on the market. The PD-4 Mobile Hard Drive Physical Destroyer is designed to physically destroy hard drives in order to prevent persons from being able to "spin" the hard drive up to retrieve data. It automatically bends, breaks and mangles the hard drive. Once destroyed, the data will no longer be retrievable. The new PD-4 has been designed with an automatic height detection system. This allows the operator to save precious time when destroying today's low profile or 1 inch hard drives, laptop hard drives, or multiple hard drives in a single sequence. Automatic sensors also will allow the operator to destroy taller half-height and network drives up to 2 inches in height with no additional user instructions. It only takes 20 seconds for the first drive to be destroyed (10 seconds for crushing the drive and 10 seconds to complete the cycle), and this completely satisfies the Emergency Destruction guidelines of NSA. The PD-4 is best utilized as the last step in your data security procedures. All other methods of data erasure leave the outside appearance of hard drives unchanged. It is impossible for the operator to distinguish a working hard drive from a non-working drive. The PD-4 Mobile Hard Drive Physical Destroyer will physically destroy as well as identify the hard drive as being ready for disposal. No hard drive should be disposed of without first being physically destroyed. 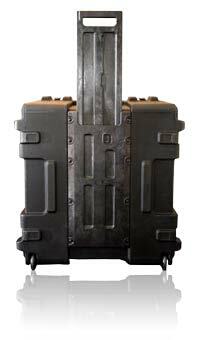 To further enhance the compact footprint of the PD-4, a wheeled transportation and carrying case is now available at an optional cost of $595.00. This allows the PD-4 Hard Drive Physical Destroyer to be easily transported to the secure location of the hard drive, rather than jeopardize transporting critical data to another location either on or off site. The PD-4 Hard Drive Physical Destroyer will automatically destroy all formats and sizes of hard drives including Network, SCSI, Servo, and IDE drives up to 2 inches in height. The PD-4 doesn't rely on software, so it will destroy all working and non-working hard drives in a matter of seconds. New security and privacy mandates now require complete erasure and/or destruction of hard drives containing private and confidential information prior to disposal. 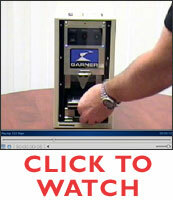 We offer a three year factory warranty for this machine at a cost of $1,050.00. The PD-4 can be purchased as a remanufactured machine at a cost of $3,975.00. The destroyer can also be rented at a cost of $1,195.00 per month. Please note commercial shipping within contiguous United States will be an additional charge. As international shipping and non-contiguous domestic shipping rates vary, we will provide a quote for your location upon receipt of your order.